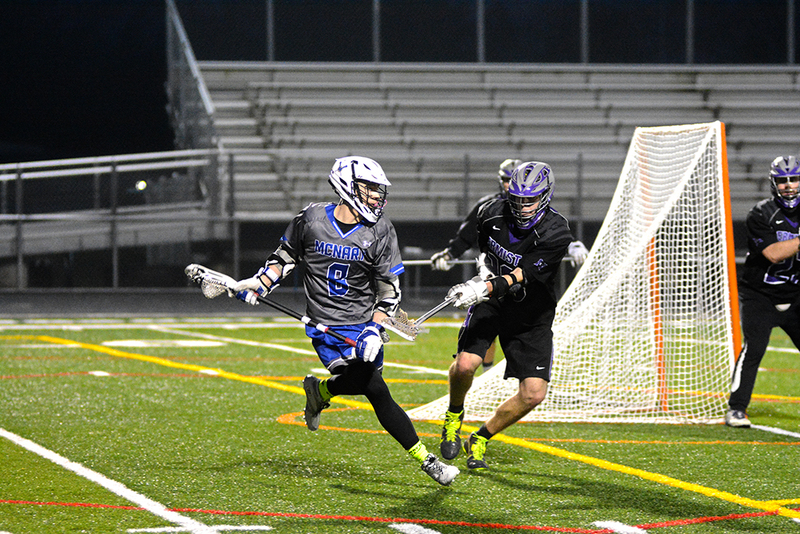 McNary lacrosse coach Ryan Bowlby needed only one word to describe Chad Pinney’s game after the Celtic junior scored five goals in a 13-9 win over Hermiston on Friday, March 17. McNary fell behind 3-0 in the first five minutes before battling back. Pinney scored the Celtics first goal midway through the first quarter and added another with 3:37 remaining. Alex McGrath then tied the game 3-3 just 14 seconds into the second quarter. After Pinney scored again with 8:14 remaining in the first half, Jonathan Williams, despite being fouled and momentarily knocked out of the game, scored his first of five goals to give McNary a 5-3 lead and conclude a 5-0 run. The Celtics led 5-4 entering halftime but Hermiston quickly tied the game and then took a 6-5 lead with 7:25 remaining in the third quarter. After Williams tied the contest back up at 6-6, Pinney again took over, scoring two more goals to give McNary a lead that would stick, 8-6 with 10:18 left to play. “We just worked as a team and just really moved the ball around, looked for the open shots and took them,” Pinney said. Hermiston twice got within one goal of the Celtics, 8-7 and 9-8, but McNary, playing two-men-up, scored four goals in the final 2:39, one each by Tyler Anderson and Jack O’Connor and two by Williams, to put away the visiting Bulldogs. Bowlby also acknowledged the play of goalie Marcus McCoy. “He came up phenomenal like always, a great athlete going after the ball, made some great saves out there to keep us in the game,” Bowlby said. The Celtics expect another close game on Friday, March 27 when Mountain View comes to Keizer.